The dividend achievers index includes companies which have managed to boost distributions for at least ten consecutive years. Every year, the index is updated to account for companies which have just achieved a ten year streak of dividend growth, and to delete the companies which have either cut dividends or failed to increase them for over one year. The Broad Dividend Achievers index includes 216 companies which have boosted distributions for more than ten consecutive years in a row. 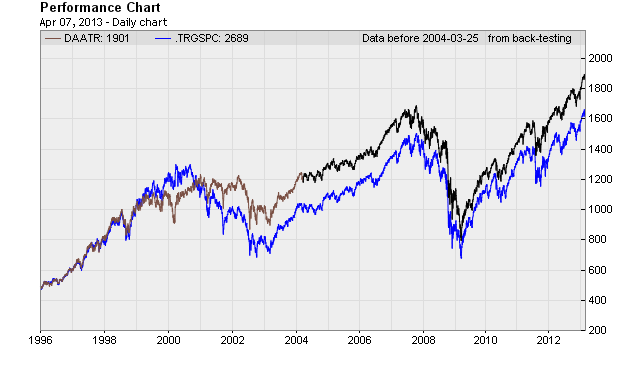 Since 1996, the Dividend Achievers index has managed to outperform the S&P 500 total returns. AGL Resources Inc. (GAS), an energy services holding company, distributes natural gas to residential, commercial, industrial, and governmental customers in Illinois, Georgia, Virginia, New Jersey, Florida, Tennessee, and Maryland. The company trades at 19 times earnings and yields 4.30%. Over the past decade, the company has managed to raise distributions by 5.50%/year. ONEOK, Inc. (OKE) operates as a diversified energy company in the United States. The company trades at 27.60 times earnings and yields 3.10%. Over the past decade, the company has managed to raise distributions by 15.10%/year. Check my analysis of Oneok. The York Water Company (YORW) engages in impounding, purifying, and distributing drinking water in Pennsylvania. York Water, which is the oldest investor owned utility in the nation, has paid dividends for 197 consecutive years beginning in 816. Dividends can be reinvested automatically at a 5% discount, in the company’s DRIP plan. The company trades at 25.90 times earnings and yields 3%. Over the past decade, the company has managed to raise distributions by 4.40%/year. Avista Corporation (AVA), an energy company, engages in the generation, transmission, and distribution of energy; and other energy-related businesses primarily in the United States and Canada. The company trades at 21.90 times earnings and yields 4.40%. Over the past decade, the company has managed to raise distributions by 9.20%/year. Cracker Barrel Old Country Store, Inc. (CBRL) develops and operates the Cracker Barrel Old Country Store restaurant and retail concept in the United States. The company trades at 17.70 times earnings and yields 2.50%. Over the past decade, the company has managed to raise distributions by 52.90%/year. The Andersons, Inc. (ANDE) engages in the grain, ethanol, plant nutrient, railcar leasing, turf and cob products, and consumer retailing businesses. The company trades at 13 times earnings and yields 1.20%. Over the past decade, the company has managed to raise distributions by 16.50%/year. Tiffany & Co. (TIF), through its subsidiaries, engages in the design, manufacture, and retail of fine jewelry worldwide. The company trades at 23.20 times earnings and yields 1.80%. Over the past decade, the company has managed to raise distributions by 22.50%/year. International Flavors & Fragrances Inc. (IFF), together with its subsidiaries, creates, manufactures, and supplies flavor and fragrance products worldwide. The company used to be on the dividend aristocrats list, until cutting distributions in the year 2000. The company trades at 25.20 times earnings and yields 1.80%. Over the past decade, the company has managed to raise distributions by 7.80%/year. Alliance Resource Partners, L.P. (ARLP) engages in the production and marketing of coal primarily to utilities and industrial users in the United States. The company trades at 11.30 times earnings and yields 6.50%. Over the past decade, the company has managed to raise distributions by 15.30%/year. Lindsay Corporation (LNN) designs, manufactures, and sells irrigation systems that are primarily used in the agricultural industry to increase or stabilize crop production while conserving water, energy, and labor in the United States and internationally. The company trades at 16.10 times earnings and yields 0.60%. Over the past decade, the company has managed to raise distributions by 11.30%/year. Lincoln Electric Holdings, Inc. (LECO), through its subsidiaries, engages in the design, manufacture, and sale of welding, cutting, and brazing products worldwide. The company trades at 17.30 times earnings and yields 1.50%. Over the past decade, the company has managed to raise distributions by 8.50%/year. Lockheed Martin Corporation (LMT), a security and aerospace company, engages in the research, design, development, manufacture, integration, and sustainment of advanced technology systems and products for defense, civil, and commercial applications in the United States and internationally. The company trades at 11.80 times earnings and yields 4.60%. Over the past decade, the company has managed to raise distributions by 24.70%/year. Check my analysis of Lockheed Martin. Maxim Integrated Products, Inc. (MXIM) engages in designing, developing, manufacturing, and marketing various linear and mixed-signal integrated circuits worldwide. The company trades at 25.60 times earnings and yields 3.10%. Over the past decade, the company has managed to raise distributions by 46.60%%/year. National Health Investors, Inc. (NHI), a real estate investment trust (REIT), invests in health care properties, primarily in the long-term care industry in the United States. The company yields 4.40%. Over the past decade, the company has managed to raise distributions by 5.70%/year. Westwood Holdings Group, Inc. (WHG) manages investment assets and provides services for its clients. The company trades at 27.80 times earnings and yields 3.80%. Over the past decade, the company has managed to raise distributions by 54.10%/year. Occidental Petroleum Corporation (OXY) engages in the exploration and production of oil and gas properties in the United States and internationally. The company trades at 16.70 times earnings and yields 2.90%. Over the past decade, the company has managed to raise distributions by 15.30%/year. Sunoco Logistics Partners L.P. (SXL) engages in the transport, terminalling, and storage of crude oil and refined products in the United States. The MLP yields 3.60%. Over the past decade, the company has managed to raise distributions by 16.90%/year. Rollins, Inc. (ROL), through its subsidiaries, provides pest and termite control services to residential and commercial customers worldwide. The company trades at 32.10 times earnings and yields 1.50%. Over the past decade, the company has managed to raise distributions by 23.30%/year. There were several eye-popping ten year dividend growth rates in the new dividend achievers list. This is mostly because these companies are in the first stage of dividend growth, which is characterized by quick dividend acceleration from zero dividend levels. The rest of the companies include turnarounds which have managed to rebuild their long dividend histories, after cutting or freezing distributions. The most important catalyst behind future distributions growth however is whether companies have what it takes to grow earnings over time. 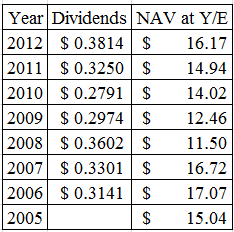 Another odd part on the dividend achievers index is that Lincoln Electric Holdings (LECO) and York Water (YORW) had raised dividends for more than 15 consecutive years. It looks as if the dividend achievers index is not as complete as the list of dividend contenders and champions, which has 304 individual companies.